Baffled by multiple tactics games? Bemused by the Final Fantasy universe? This could be the place to begin. The clue is in the title: Final Fantasy Tactics A2 picks up where Final Fantasy Tactics Advance left off, instead of taking the series’ forebear, Final Fantasy Tactics, as its starting point. 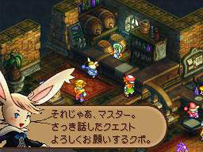 For the benefit of anybody unfamiliar with pre-PSP Ivalice, that means a wider selection of playable races, a more involved and engaging career progression and skill structure, a more interesting quest system, a customizable world map, and the return of judges, who lay down the law on the battlefield with an impervious steely will. 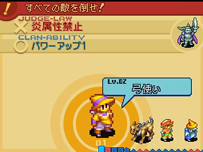 It also begins as the GBA game began: with the youthful protagonist (in this case a young boy called Luso) discovering a grimoire that transports him to the world of Ivalice. 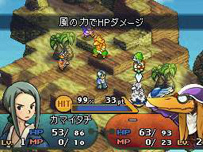 The difference is that, this time around, Ivalice contains even more jobs, playable races and quest types, and crisper, more assured visuals – although three games in, navigation of the battle map can still cause problems when things get a bit congested. Gaming theologians will no doubt question whether the game takes place in the ‘real’ Ivalice of the original Tactics and FFXII, or the ‘imagined’ world of Tactics Advance. The answer is probably beyond mortal comprehension, though Vaan and Penelo (last seen in Revenant Wings) do put in an appearance. Apart from that, it’s business as usual – which, as anyone who lost hundreds of hours to the GBA original can attest, is excellent news. For anybody who didn’t have that pleasure, The Sealed Grimoire looks like a perfect starting point.